Cardboard skies have given way to a beautiful Wednesday heading into what looks like a dreary end of the week. This doesn’t necessarily include the weekend. Thursday will be hot and humid with thunderstorms likely on Friday as we will reside in the ‘warm sector’ of a mid-latitude cyclone. The warm sector is a region of warm moist air that is located between the associated warm front and cold front of a low pressure system. Typically, the warm sector is a nice place to look for thunderstorm development as the cold front sweeps behind acting as a lifting mechanism. This will be the case on Thursday with hot and humid conditions in place, and an increased chance of thunder on Friday when the cold front moves through. Forecasted surface map for Thursday evening showing Michigan in the warm sector behind the red warm-front, and blue cold-front following for Friday. Cooler and drier air will move in for the weekend as the cold front wipes this mess clean. An area of high pressure will dominate this weekend bringing temperatures in the mid 60s and clear skies to the area. Tropical weather is off to a slow start as Tropical Storm Humberto wanders along disorganized out in the Atlantic. Humberto is expected to remain a Tropical Storm, and take a journey northward. A broad region of low pressure over the Yucatán Peninsula looks promising, but remains plagued by its own disorganization. As this area moves north and west, it is expected to achieve depression status, but this is over the next 48 hours. In the Eastern Pacific, Tropical Storm Manuel is docking along the Baja peninsula. Manuel is actually on the weather map above painted as a Tropical Depression in the coming days. Big story this week is our temperature fluctuations. Around the beginning of September, temps were right on the money and we were getting that nice Fall vibe going on. 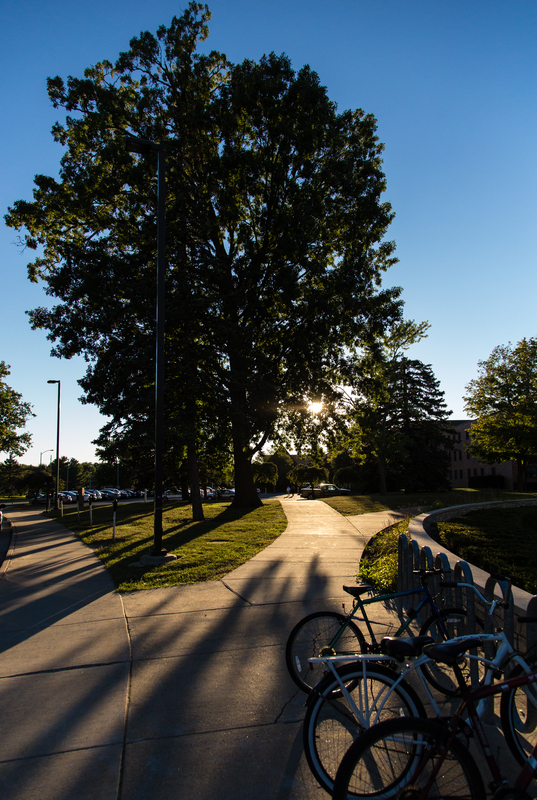 Beautiful weather topped off last week with highs in the mid-70s and clear skies. It also felt nice and crisp outside, actually noticed this due to slightly increased distance visibility. Our slate had been wiped clean early in the week after some storms, and the humidity had retreated south. However the weather systems had other plans and threw us a curve ball early this week. Today felt like we were back in the middle of summer! Highs topped out at 93F today, dew-point temps were in the mid 60s, so the humidity was around as well. This is all thanks to a ridge that developed early this week which pumped warm, moist, southern air into our region. Last week with our cooler temperatures, a strong low pressure area over NE Canada provided us with air drawn from the cooler north. So we are seeing tales from both sides, in other words, Fall. The heat won’t last long. This was the one day that stood out reaching the 90s. We will begin cooling down for the rest of the week, and enjoy a 60s weekend. With this temp swing, there are scattered showers and thunderstorms to go with it. These won’t last past Thursday evening. A few short-range, high-resolution models show a line of showers and thunderstorms developing along the cold front as it slowly drapes across the region. This line will begin in northern Michigan late tonight/early Wednesday morning and progress SE. Bottom Line: This was a one-off hot day, expect the next two days to be cooling down, but filled with on and off showers. Weekend looks clear and cool. Enjoy temperatures in the mid 60s, 30 degrees cooler than Tuesday! Another round of warm temps will grace us with its presence this week before a questionable weekend ahead. Lets take a look. Thick fog and some convective storms has been the highlight of the past week. I believe all day Tuesday I didn’t even get a glimpse of a cloud deck. We were in a ground fog all day. A thick layer of stratus above helped limit fog burn off, and this was confirmed when rain and drizzle started mid day. The steam from the CMU boiler is fun to keep track of as days roll by. You can tell a good bit by analysing how fast the steam burns off or what direction it takes. In these days of high moisture, the steam lasts a lot longer. Instead of a short few hundred meters from the source, it was pacing across campus today. Dynamic skies are all about recently. Last Monday I was out taking photos and almost got caught in a storm. It was after a bunch of rain, and as I biked across a field, I could feel my tires sinking in a making a lovely squishy splashy sound. A few temporary rivers were alive in drainage areas. Parked the bike and walked a bit. To the northwest a glaciated cumulonimbus could be seen giving its last breath. The west shown a large wall of stratus moving in. The sun was setting and met the edge giving it a crisp light edging to it. A deck of ragged cloud was moving through fast. Then south, convective clouds were firing. Most of Friday and Saturday were spent under cloudy skies thanks to a low pressure system that was ‘cut off’ from the main jet stream These tend to stick around longer because there is little motivation for the area of low pressure to move along. Sometimes you get lucky and they intensify so much, they look like a hurricane forming in the middle of a continental area. 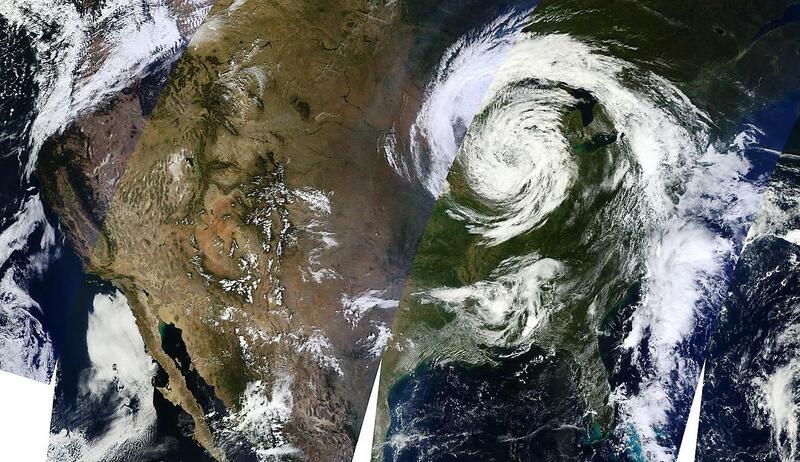 Not from this past event, but a very prominent feature from Sept 27, 2011 on MODIS Today. Further reading and information can be found on the CIMSS Blog. As this feature exited Sunday and Monday, a ridge of high pressure built that allowed us to see warmer temperatures. These are expected to continue through Thursday where we could see the mid 70s. These temps will again be pushed down by a cold front that sweeps through Thursday Night/Friday. Temps will setting in the 50s on Friday. Lingering precip could include some wet flurries as cold air filters in. After the weekend, things get interesting. Lots of talk about our first flakes of snow…to a massive deluge of snow(no hype here!). What has been briefly hinted at by the European model is a tropical disturbance (now Tropical Storm Sandy) will come up the east coast, at the same time the front comes through our area on Thursday. I really don’t know how to explain the next bit, because computer forecast models can pull the silliest stuff out of a hat at long-range forecasts. Anyway. Sandy gets stuck under the front and would start to drift inland causing tons of precip of all ranges in the Great Lakes/Northeast. Including snow in our area. Early trends said we would get some absurd amount of snow (like 2 feet, no problem). However, the ECMWF model is all alone in this case against other models, so only enjoy this model as a early winter buzz. GFS model has none of this, and keeps the systems separate. Sandy will pull off east as the front pushes through normally. Possibly a little secondary low development is there, but we’ll see. Will watch this storm situation as the weekend approaches, and Sandy organizes.